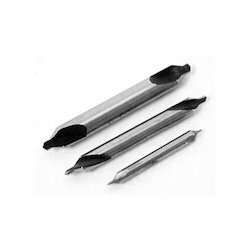 Pioneers in the industry, we offer center drills from India. Riding on unfathomable volumes of industrial expertise, we are offering an excellent range of Center Drills. These drills are widely used to drill a hole. Our talented professionals only use fine quality material, while manufacturing these drills. The provided drills are excellent on count of performance owing to their robustness and easy installation. Moreover, our offered drills can be availed in a wide range of sizes and shapes, according to the needs of our renowned customers.